Hospitality Lawyer with some grim predictions and observations for hotel lenders and owners. On June 24, 2009 the Federal Reserve left interest rates and its policies unchanged. Government forecasters predicted that unemployment will continue to rise from its already high level of 9.4% and will not begin a reverse trend until “some time next year.” And today in CNBC and Bloomberg interviews, Warren Buffett said he sees unemployment continuing to rise. He does not seem to see “green shoots” of economic recovery in the United States. Here is some more information on the continuing crisis in the hospitality industry. We are not pessimists. But as long as we see continued bad news for the hospitality industry, it does not seem responsible to us to predict unrealistically cheery prospects. We think that owners and lenders need the best information that they can gather to assess investment situations and timelines. How else do you chart viable strategies and approaches. Hospitality Lawyer: Lender and borrower alternatives for troubled hotel mortgage loans. If hotel values are likely to continue to decline at least through 2011 or 2012, isn’t it prudent for a lender or owner to know that in deciding whether to continue to try to hold on or to increase the bet? See Mark Woodworth’s ‘Night has fallen. Waiting for sunrise’. and Steve Rushmore’s What lies ahead for the hotel industry? When do values bottom? When do they recover?. In this spirit of optimizing information, we will continue our observations on important economic and industry developments. We don’t see a recovery until many months AFTER the economy bottoms and begins a substantial and sustained upward trend. See PKF says 2009 worst year in lodging history. Robust recovery likely but years away. Unfortunately, the predictions for that upward inflection (as opposed to just the bottoming) are not in place yet. Meaningful economic recovery for our country and the hospitality industry will require that financial institutions be healthy again, consumer debt be restored to more normal levels, the housing bust gets cleared up, dealing with the overhanging credit card and commercial real estate problems, and creating employment to replace the 7 million jobs lost since December 2007. THEN maybe we can get credit flowing again and eventually get leisure and business travel growing to fill empty hotel rooms. Lessons for lenders and sellers to be learned from a deeper look at the California hotel markets? 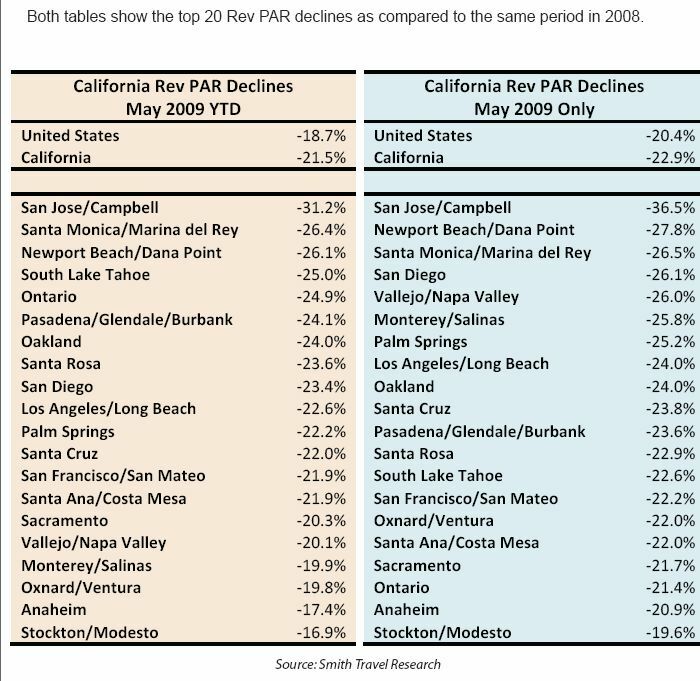 The following chart from the Atlas Hospitality Lender newsletter shows that 24 out of the 27 California markets have double-digit RevPAR declines on a 2009 year-to-date basis. Led by the San Jose/Campbell area (-36.5% RevPAR decline in May 2009), there are 19 major metropolitan areas in California with more than a 20% RevPAR decline in May 2009! The 2-page newsletter can be downloaded by clicking here: Atlas Lender News. By the way, Atlas Hospitality Group specializes in the sale of California hotels. It was founded by Alan X. Reay in 1997. Since its inception, Atlas has sold more hotels in the state than any other brokerage firm. Regarded as “the expert” in the California hotel market, Alan Reay has been quoted in numerous major publications including the Wall Street Journal, Los Angeles Times, and many other financial and hotel industry publications. Alan Reay can be reached at (949) 622-3409, alan@atlashospitality.com or www.atlashospitality.com. So what should a lender or borrower do with this information? Have realistic price expectations and move quickly. The market will continue to deteriorate for some time. You may not like the price for a hotel today, but you will like it less in 6-12 months. There will certainly be some interesting challenges and opportunities ahead of us in the hospitality industry everywhere. Maybe there are some lessons here for all of us.